Setting up a fire extinguisher? ThornsofTime wrote: If your planing on using it for a bbmg, I would recommend a CO2 tank instead. They can easily hold 800psi (a good bit of air) and can be dialed into what ever psi your going to use in your gun with an inline regulator. The fire extinguisher tank might be better used in a different project. The dry powder ones I have are rated to 35 bar, so they will happily take 500 psi if you are filling with a fridge compressor or similar. Are they still in the lab or have you borrowed them ?? POLAND_SPUD wrote: Are they still in the lab or have you borrowed them ?? The need isn't so pressing as I can decant from my scuba tank but I've been on the lookout for a fridgy for a while now, it would be good to have an HPA source I can refill at home. I've still got to find a use for several. I'd point out that while they've been <s>rated</s> tested to 200 bar (although they are now long out of their test period), these ones are equipped with safety valves that burst at 190. Not really a problem though - that's more than enough for most purposes! Last edited by Ragnarok on Fri Oct 22, 2010 11:29 am, edited 1 time in total. You had better get busy! Are these the specjifications for the ones you have? dewey-1 wrote: Are these the specifications for the ones you have? Pretty much. 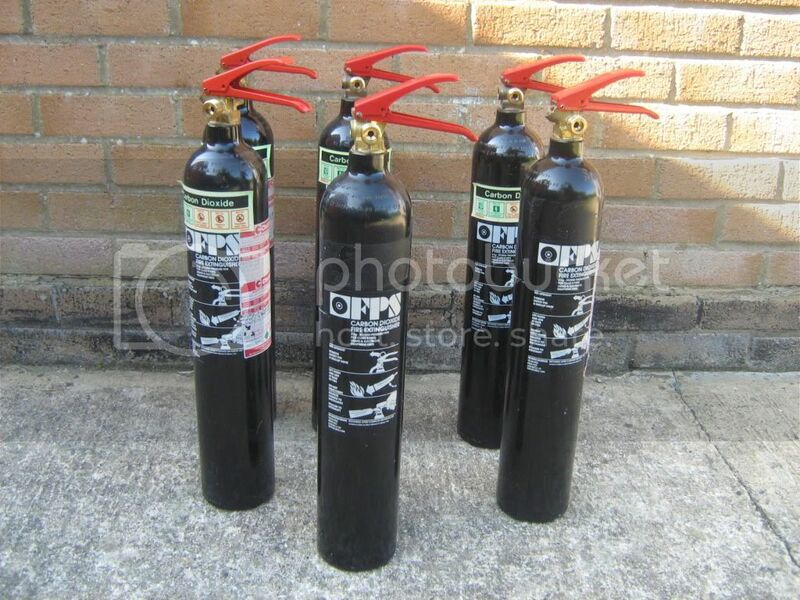 As far as I know, all seven (one of them isn't shown in that picture) meet the typical 2kg CO2 extinguisher specs - in all except that they're black. These days, regulations demand they be red, which why these ones found their way into my hands. when will you switch to metric units? POLAND_SPUD wrote: when will you switch to metric units? We pretty much do. There are only three common uses of Imperial units in the UK - road signs (yards and miles), milk/cream (usually in pints, although increasingly less so), and beer (pints, of course). The really daft one is road signs. As fuel is only bought in litres, it means either of the common fuel consumption figures (MPG or litres/100km) is easily used. As far as "civilising us"... not really. These were originally from a stage, and the black ones were far more ideal - as they weren't quite so bleeding obvious. The fact they were black also helped prevent an accident. Stopped a totally brain-dead actor finding and using an extinguisher they were completely untrained to use (CO2 extinguishers are pretty dangerous if misused). There's always going to be an idiot who doesn't listen to the "If there's an emergency, tell the stage crew" instruction. Anyway they would make a nice hybrid chamber or air reservoir for a fridge compressor. The hybrid chamber idea can't really happen unless I can get the valves out of the neck - and they appear to have been mechanically tightened, so it's going to take some more ingenuity. But the restriction of a valve is less of a problem for a high pressure reservoir - it's perhaps even desirable to be able to close it off. Ragnarok wrote: The hybrid chamber idea can't really happen unless I can get the valves out of the neck - and they appear to have been mechanically tightened, so it's going to take some more ingenuity. 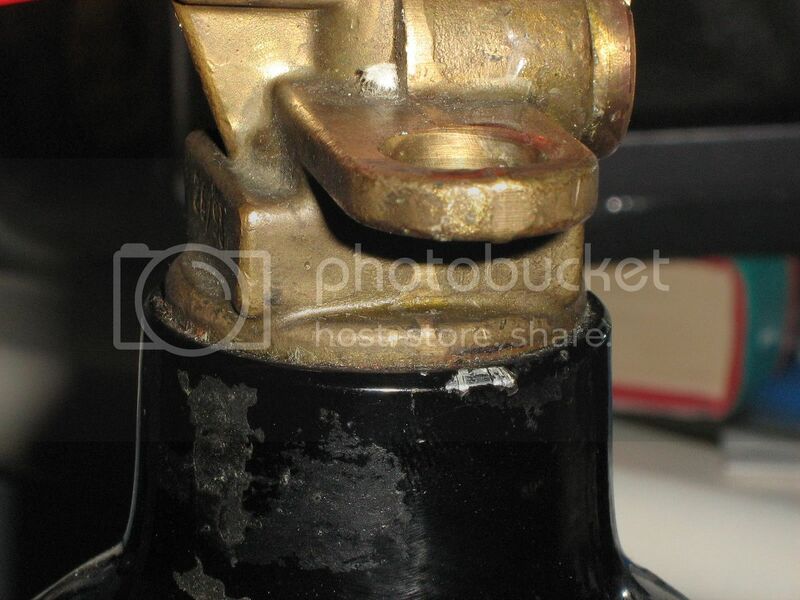 The brass valve may have a "permanent" type of thread lock sealant on it where it threads on to the neck. A little heat applied at the neck may soften the sealant. Can you post some close up views of the neck and valve for visual analysis? 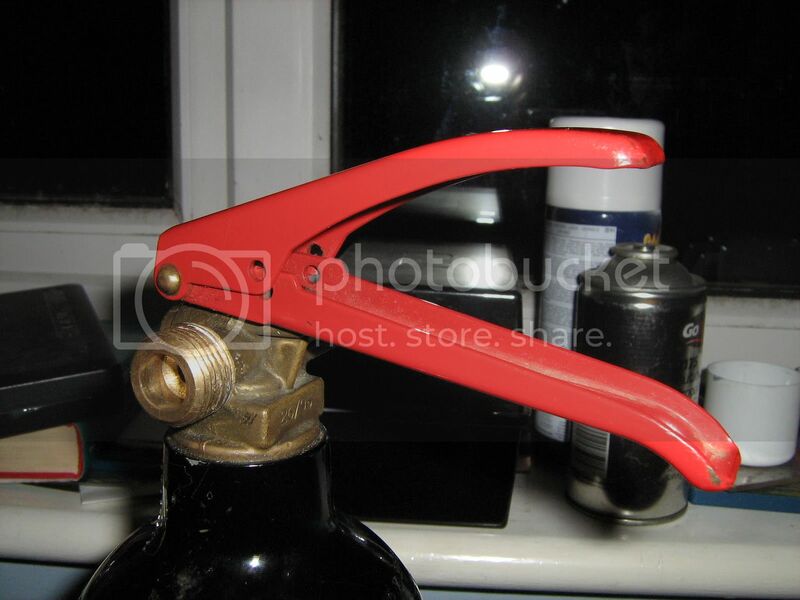 with both my fire extinguishers i keeps the original valve. the nozzle that came with them was already npt so i didnt have to mod the tanks at all. i fill both to 350psi and reg it down to 200psi and under. i dont use the fire extinguishers now that i got my 8 gallon 400psi tank and my 20lb co2 tank. dewey-1 wrote: A little heat applied at the neck may soften the sealant. If possible, I'm trying to keep heat applied to a minimum. I don't know what the alloy is or how much it's dependent on heat treating. The neck is about 43mm across at the very top. Threads are known to be M25x2 (confirmed on bottle neck stamp). I have been wondering about the possibility that they're reverse threads, but I've found little evidence on the internet that they might be. If you don't mind getting rid of the valve, one trick I've used in the past is to cut off the valve at the neck so you're just left with the threads in the bottle neck. Then, using a hacksaw blade, put it inside the bottle neck and cut about half way through the threads left over from valve. If possible, try and leverage the threads from the valve inwards and hopefully it will crack at where you cut through half way. Do that again 90 degrees further around the threads and then you'll have a chunk come off the threads, do it again and again until you have all the bits from the valve that were threaded in. Ragnarok wrote: If possible, I'm trying to keep heat applied to a minimum. I don't know what the alloy is or how much it's dependent on heat treating. Here is a possible OEM source for those cylinders. Probably one of the first two on the spec sheet. You may have to use one as a "sacrificial lamb" to remove valve.